The success of the conservative narrative ought to trouble liberals and the Obama administration. The president has had to “own” the economic catastrophe much earlier than he should have. Most Americans understand that the mess we are in started before Obama got to the White House. Yet many, especially political independents, are upset that the government has had to spend so much and that things have not turned around as fast as they had hoped. ….The truth that liberals and Obama must grapple with is that they have failed so far to dent the right’s narrative, especially among those moderates and independents with no strong commitments to either side in this fight. The president’s supporters comfort themselves that Obama’s numbers will improve as the economy gets better. This is a form of intellectual complacency. Ronald Reagan’s numbers went down during a slump, too. But even when he was in the doldrums, Reagan was laying the groundwork for a critique of liberalism that held sway in American politics long after he left office. Liberals can win elections, but they still have trouble winning the narrative. There are dozens of plausible explanations for this, but the noise machine still seems like the biggest one to me. 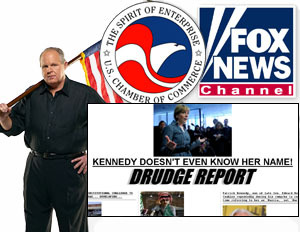 There’s simply no liberal counterpart to Drudge and Fox and Rush: a conservative commentariat that concedes nothing, pounds home its points like a jackhammer, repeats its themes relentlessly, and has the ear of the Washington mainstream press in a way that liberal commentators don’t. Dionne calls their approach the “audacity of audacity,” and the press seems to take it as evidence of sincerity in a way that they don’t with liberal arguments. As a result, even when they think conservatives are misguided the Washington press largely grants them the presumption that their beliefs are driven by deep and earnest heartland principles. Liberal positions, by contrast, are more often portrayed as a crude collection of special interests and cynical political calculations. That’s hardly the whole story, but it’s a big part of it. And I’m not sure what the answer is. The noise machine, even against the backdrop of humiliating failure over the past decade, remains an overwhelming presence. For more, see Paul Krugman today.